If we were going to give the new 2018 Toyota C-HR an initialism, we would call it an UAV (Urban Assault Vehicle) or perhaps a FUV (Fun Urban Vehicle). Toyota says the C-HR stands for Coupe High-Rider. It represents a stylish and sporty new design language and they?ve introduced it with some very cleaver fairytale-like commercials. 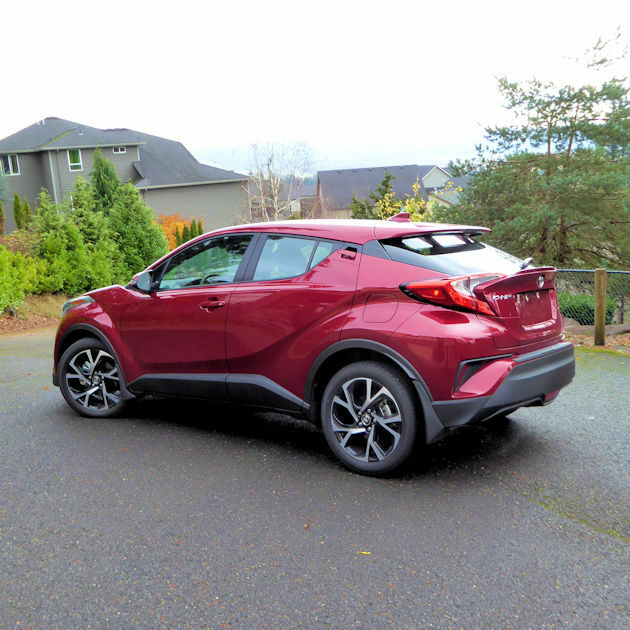 ?The all-new C-HR is truly unlike any vehicle Toyota has ever launched,? ?said Ed Laukes, group vice president, marketing, Toyota Motor Sales, U.S.A. ?One of our main objectives was to spark interest and enthusiasm in a creative campaign equally as captivating as the vehicle itself. The fairy tales we use in the creative elements are timeless classics, but we?re telling them in a fresh and mischievous way.? Check them out on YouTube if you haven?t already seen them, they are very entertaining. 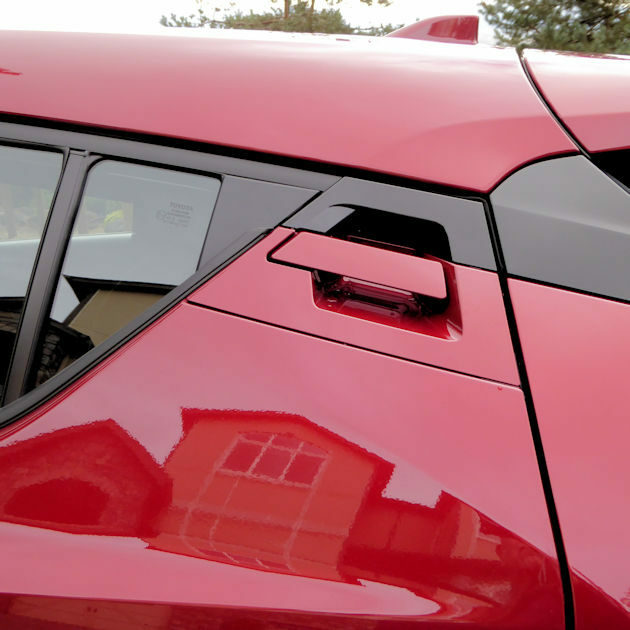 The C-Pillar was the source of our only major complaint about the C-HR ? which was it was nearly impossible to see out to the rear sides. Fortunately, the model we tested had the XLE Premium Package which included the Blind Spot Monitor and Integrated Cross Traffic Alert systems. 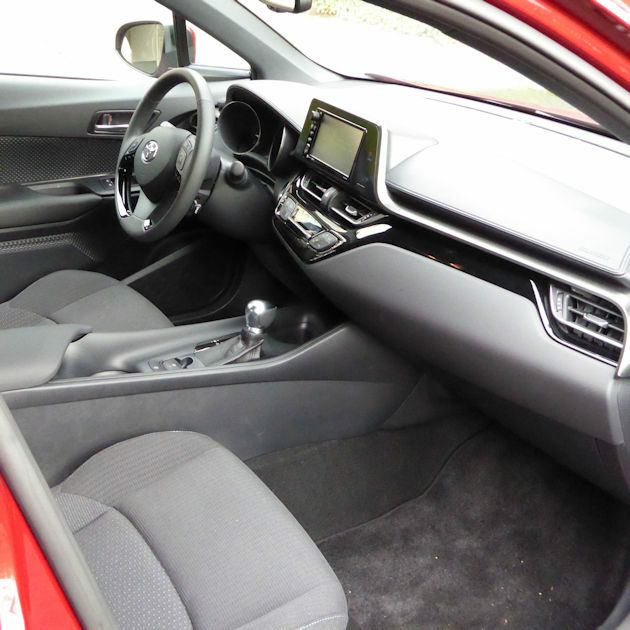 The interior has a simple clean driver-oriented design. The center stack with the large high-mounted seven-inch touch screen was canted noticeably toward the driver for easy visibility and access to the audio and climate-control functions. 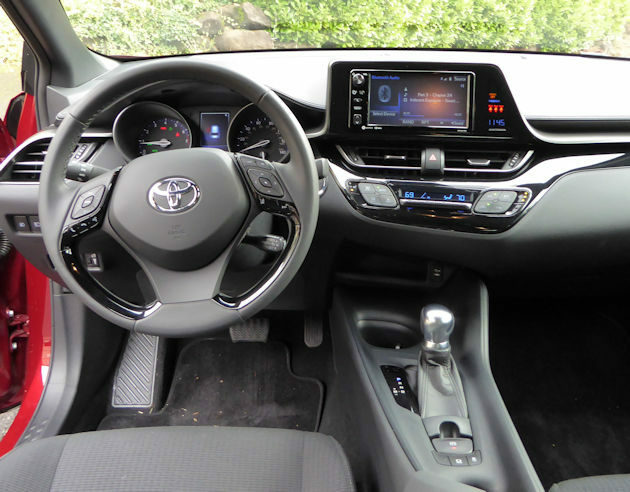 Toyota calls it a driver-centric ?MeZONE? orientation. The twin pod instrument panel is easy to read as is the information screen mounted between the pods. We were disappointed that the C-HR does not have a navigation option nor Apple CarPlay or Android Auto available. Soul, Nissan Juke, Mazda CX-3 and several other subcompact crossovers. It?s a nice agile size that maneuvers easily through crowded streets and tight parking lots. 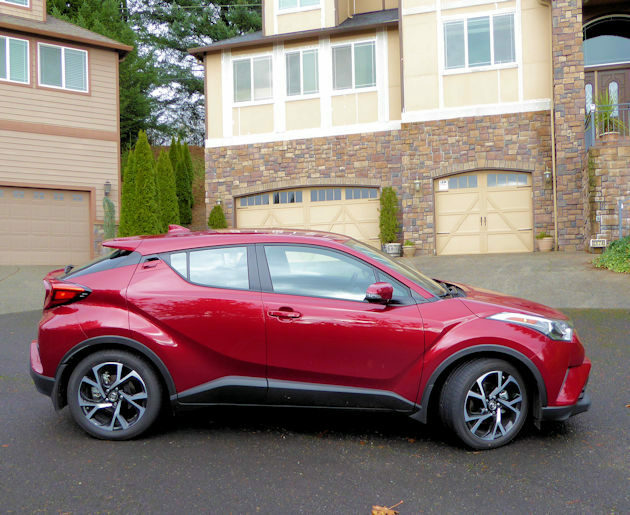 But the C-HR is strictly a fair-weather, on-road style vehicle because there is no all-wheel drive option. A 144-hp, 2.0-liter DOHC four-cylinder engine with a CVTi-S transmission powers the front wheels of the Toyota C-HR. The engine has the latest generations of Toyota?s Variable Valve Timing and Valvematic to enhance fuel economy, which the EPA estimates at 27 mpg city, 31 mpg highway and 29 mpg combined. The trip computer said we averaged 28.1 mpg during our week behind the wheel. The combination is comfortable to drive, but not something that?s going to provide more than adequate acceleration. A zero to 60 mph run takes 11.0 seconds according to buff magazine tests. The Continuously Variable Transmission with intelligence and Shift mode is one of the nicer CVT transmissions we?ve driven. This transmission simulates the shifting of a seven-speed automatic transmission, so it doesn?t have the mushy sound and feeling often associated with CVTs, plus it allows the driver to shift manually. 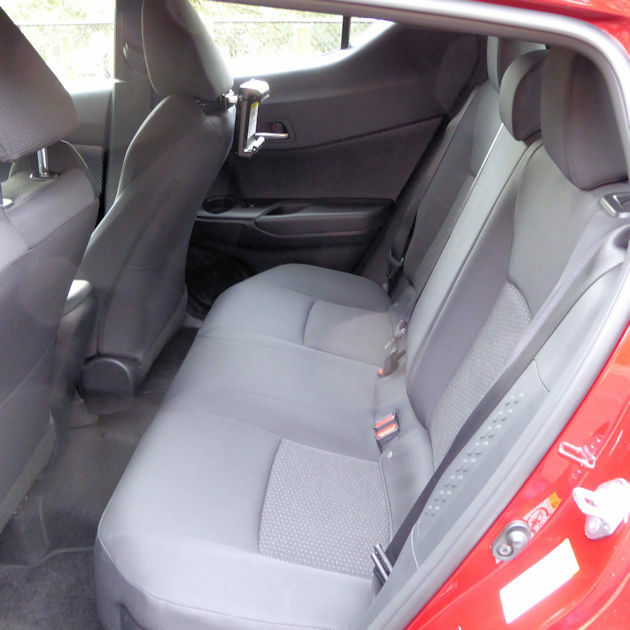 Four people can ride comfortably in the C-HR, but the rear seat feels somewhat closed in by the broad ?C? pillar, front seat head rests and small side and back windows. It will fit five in a pinch, but it?s best suited for wee ones. 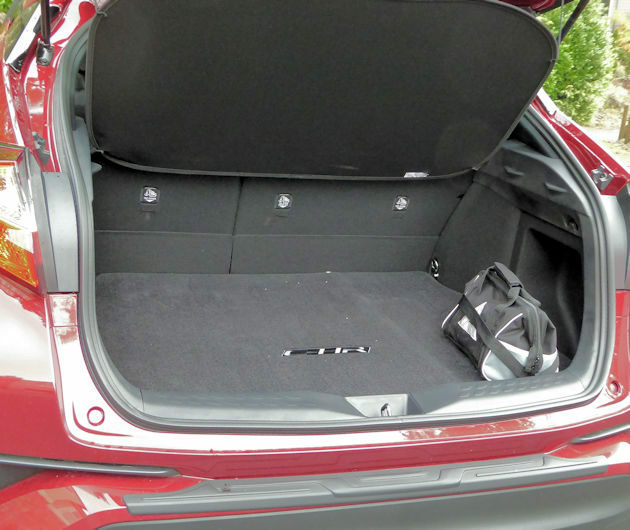 Cargo space is 19.0 cubic feet behind the rear seats and that expands to 36.4 cubic feet when the split rear seat back is total folded. 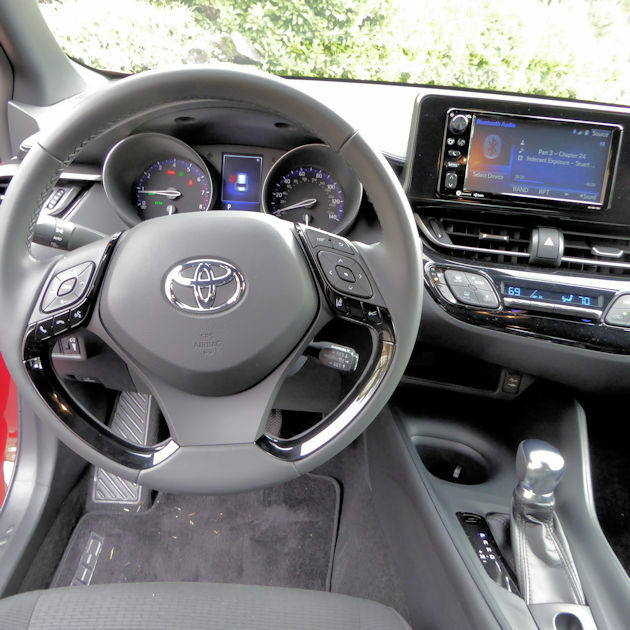 The XLE Premium model we drove was equipped with two Toyota-first features: the Driver Distraction Secure Audio (DDSA) and Brake Hold Function. DDSA prevents certain multimedia menus from being selected while the vehicle is in motion. The Brake Hold Function is one of our favorites. It maintains braking force at all four wheels to keep the vehicle stationary when at a full stop without the driver having to keep pressure on the brake pedal. Once the driver depresses the accelerator, brake pressure will release, and the vehicle will move forward. It?s a function that can be turned off for drivers who don?t care for the intrusion. The C-HR was designed initially to wear a Scion name badge, but with Toyota pulling the plug on Scion in mid-2016 they slotted it in the Toyota lineup, and it?s a nice addition. 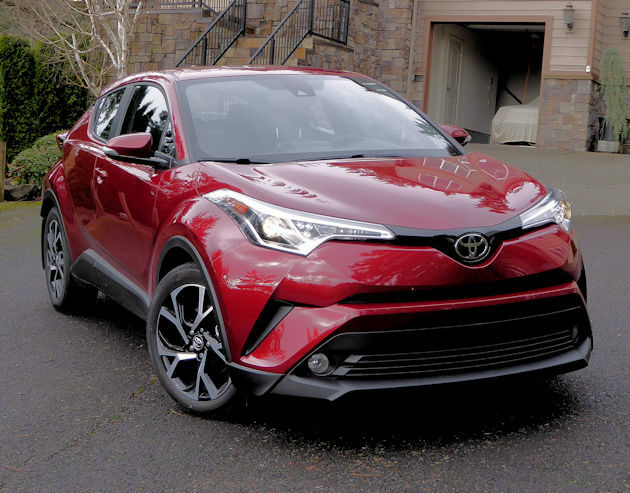 The 2018 Toyota C-HR is available in two models: XLE and XLE Premium which has respective prices of $23,495 and $25,345. The Premium has no option package available, but there is an extensive list of aftermarket accessories, like mats, wheel locks, etc. 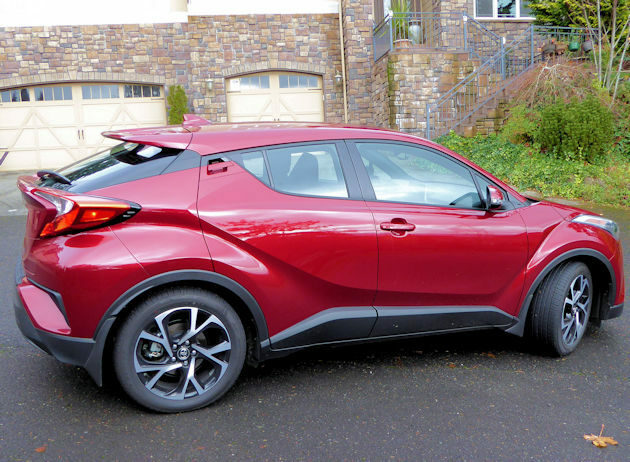 The 2018 Toyota C-HR should be on the ?must drive? list of anyone shopping for a sub-compact UAV, FUV or fun little crossover.